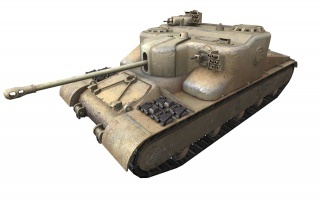 It was the first British tank destroyer to be added to the game. Nicknamed the "AT-AT", this tank is a slow moving warehouse, as such, it has good frontal defense like the Ferdinand and carries a fast-firing gun. While its alpha damage is very low, its reload time and accuracy ensure that no opponent wants to stay in your line of fire and risk being punctured to death. The AT 15A received a buff in patch 9.4. The high frontal armor, while sporting great-looking stats, is tempered by a huge weakspot in both the large frontal plate below the gun and also the gun slit. The effective armour of the frontal plate can be vastly improved through angling the tank and the gun slit is pretty hard to hit. 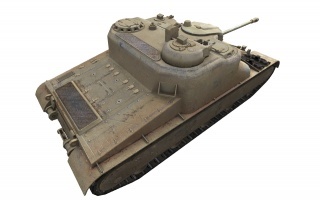 When properly angled, the front armor can bounce most rounds from Tier 7 and many Tier 8 tanks. The wide gun traverse helps greatly with angling. The gun is very accurate but rather weak in terms of penetration and damage. 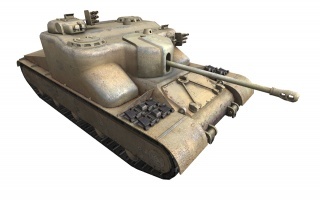 Knowing weakspots on enemy tanks is crucial for having success with this tank, as many opponents cannot be penetrated without hitting a weakspot. Unfortunately, the AT 15A is slow and unmaneuverable, making it easy prey for artillery and flankers. 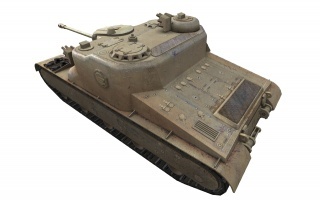 The high armor on the sides and rear will save you from scouts and some Tier 5 to 6 mediums. As the ammo rack is easily damaged it's recommended to train repairs and save the repair kit for ammo rack damages or crucial situations (tracked in close combat etc.). Keep your enemies in front of you and at a distance and always travel with allies so they can hold off flankers. Also, use hard cover whenever possible, as artillery can seriously cripple you. The income generation for the AT 15A is poor and worse than E25. Poor penetration on its gun forces players to use premium rounds excessively and its poor mobility doesn't allow it to engage in battles early. 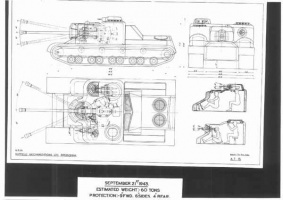 The AT-15 was a Nuffield design suggestion from September 1943. After numerous experiments with asymmetrical design, army insisted on a vehicle with a gun mounted on the central axis. With AT-15 guidelines that will emerge A39 Tortoise were more then visible. Final proposal had 152 mm of sloped armor on the front, and 100 mm on the sides. Main armament consisted of the famous 17 ponder gun, which was at the time considered enough to penetrate any German armor it stood against. AT-15A was a slight modification of the project that was some 5 tons heavier. This page was last modified on 7 March 2019, at 05:13. This page has been accessed 229,160 times.